Having already looked at the worst of 2017, it’s time to be a bit more positive. The year produced a number of great films, which only made making this list more difficult, but these are the films that stood above the rest. From the visual marvels to the subtle dramas, from the blockbusters to the indies, these are the best films of 2017. A film that matches its narrative beauty with the crisp lines of its architectural background, Columbus is a tender and loving film that should not be missed in 2017. The best pure horror film of the year, Raw delivers plenty of creepy imagery as well as horrifying themes to make it memorable far beyond when the credits roll. 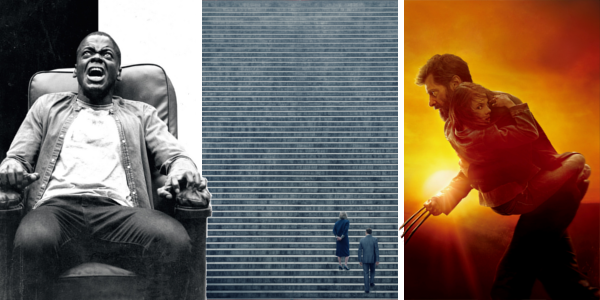 Throughout the past eighteen years of superhero films really taking over Hollywood, none have approached the level of emotion that Logan gets out of its material. Seeing Hugh Jackman get one last turn as the Wolverine in an unrestricted, western style film is amazing and the craftsmanship from director James Mangold makes Logan not only the best superhero film of 2017, but one of the best of all time. While as equally divisive as it was anticipated, Star Wars: The Last Jedi takes the franchise in a bold direction. Director Rian Johnson isn’t afraid to throw everything out the window and take these new characters to challenging places, some of which are sure to piss some “fans” off. The visuals are some of the best in the franchise, with a few moments in particular that will make your jaw drop. Easily the most human film of the year, The Florida Project finds the innocence of childlike wonder in even the bleakest situation. Newcomer Brooklynn Prince is wonderful as Moonee and has one the tear-jerkiest moments in cinema this year, while Willem Dafoe steps out from his typical role to give one of his best performances ever. Director Sean Baker has such a sympathetic touch that few filmmakers can match and it pays off in spades here. The romantic comedy is certainly not a dead genre, though certainly not thriving either, The Big Sick just so happens to be a breath of fresh air that it may have needed. Real life couple Kumail Nanjiani and Emily V. Gordon have taken their story and translated it into this heartfelt, hilarious, and joyful film. Though it isn’t getting the same buzz as the films above it, The Big Sick is just as worthy of your attention as just about any film this year. A perfect blend social commentary and horror goodness, Get Out is the type of film that only gets better with each re-watch. Jordan Peele bursts onto the film scene with top-notch direction and a tight screenplay that has produced a thought-provoking and darkly comedic film that stands as one of the better actors turned director debuts of all time. The film released all the way back in February and has maintained its high spot since, if not moved up a little. Another directorial debut, this time in Greta Gerwig, Lady Bird is a genuine and lovely coming-of-age film. Marked by a handful of award worthy performances from Saoirse Ronan and Laurie Metcalf, Lady Bird stands out as a charming and quirky look at the uncertainty of adolescence. Sure to be an award show frequenter, Lady Bird is the closest thing to a modern John Hughes film we may ever get. Eloquent and emotional, Call Me By Your Name captures its themes remarkably well, demonstrating the melancholy of lost love with ease. The film feels real almost as if you’re watching it in real time and it’s a testament to the direction of Luca Guadagnino. Held down by a subtle performance from Timotheé Chalamet and a confident one from Armie Hammer, CMBYN is a gorgeous film from start to finish. No other film this year matches the technical mastery on display in Dunkirk. From the exhilarating and dramatic score to the heart pounding visuals, the World War II drama excels in the details. Combine that with an interesting story structure from Christopher Nolan and you’ve got a near perfect film. Though no film is as well-crafted as Dunkirk in 2017, the other two films on this list manage to hit the emotional notes just a bit more. And here we are. I loved the film when it released and I’ve only loved it more with each subsequent viewing. Everything from the visuals, to the music, to the cinematography, to the acting, and even the story its continuing to tell, Blade Runner 2049 is a masterpiece that somehow manages to improve on its predecessor. Director Denis Villenueve has produced some of the best films of the past five years, and Blade Runner 2049 only continues that streak. And that’s my list, the best ten films of 2017. So what do you think? Do you agree with the list? Are there some there that shouldn’t be? Or maybe some that should? Share, subscribe, comment below, and as always return to I Am Sam for weekly reviews and insight.